Topics: Maurice Bramhall, & Insurance Industry. a-professional-apprais.. 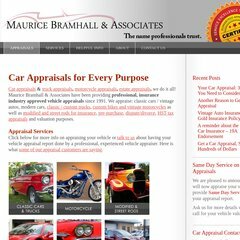 Contact Us - Ontario Car Appraisals by Maurice Bramhall & Assoc. a-professional-apprais.. Helpful Info - - Car Appraisals and Vehicle Appraiser in Ontario ..
a-professional-apprais.. About - - Car Appraisals and Vehicle Appraiser in Ontario (Maurice .. The site has about 14 users daily, viewing on average 6.00 pages each. The programming language environment is PHP/5.3.10. Host Papa Inc (New York, New York City) is the location of the Apache server. Its 2 nameservers are ns1.hostpapa.com, & ns2.hostpapa.com.